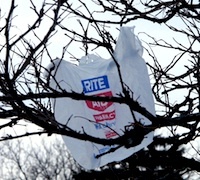 Calling plastic bags "urban tumbleweed," L.A. County Sup. Zev Yaroslavsky was among the voters on the Board who helped put a sweeping ban on the items today, according to LA Now. Joining Yaroslavsky were Sups. Gloria Molina and Mark Ridley-Thomas, with Sup. Michael D. Antonovich opposing, and Sup. Don Knabe absent. The ban will affect unincorporated L.A. County, and will mean single use bags will not be available at stores. "An exception would be made for plastic bags that are used to hold fruit, vegetables or raw meat in order to prevent contamination with other grocery items." Paper bags will be available for a surcharge. The ban will begin in July 2011, and be implemented in phases.